I made Japchae (잡채) a couple of weeks ago for my hubby’s birthday, and I thought I should share my recipe! 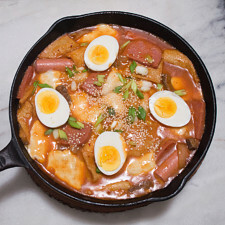 Originally made for Lunar New Year this year, I made extra to eat during his birthday and for a few days after. Noodles are eaten around this time of year to symbolize the longevity of life; eating long noodles brings us luck. 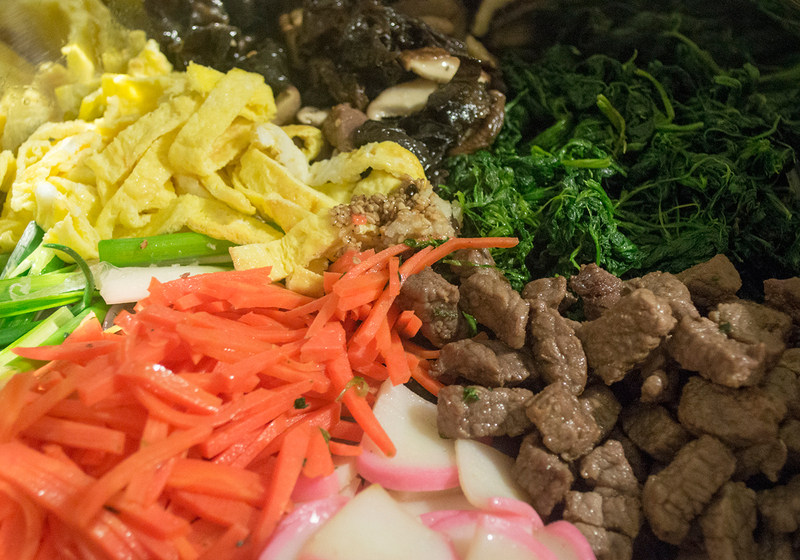 My mom would always make us japchae during a holiday, and I loved it when I got to help her chop ingredients. I would sneak a piece of mushroom or fishcake while she went ahead and prepared the other components. At the end, I would also get to taste-test the mix and help her adjust the flavors. That was my favorite part of being in the kitchen. 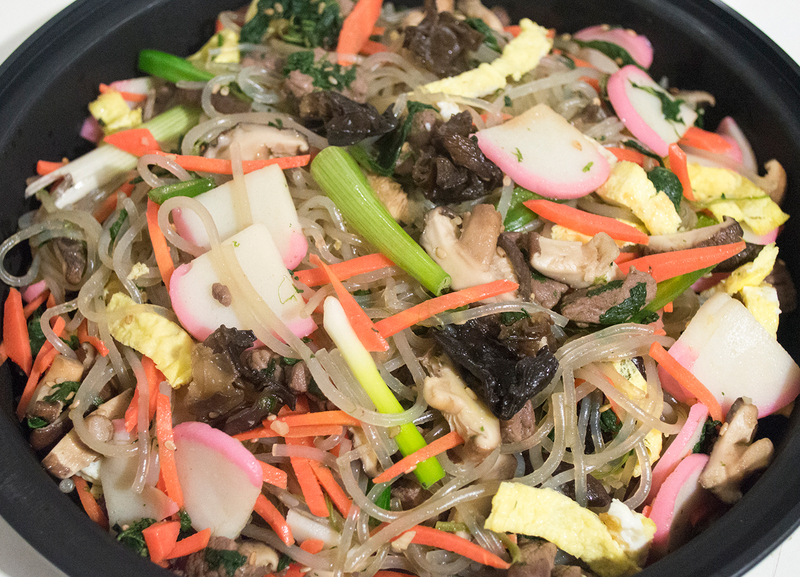 Since japchae really means “vegetable mix”, this can be made in a number of different ways. 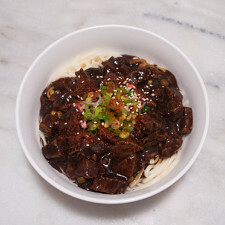 Here is my version of this classic noodle dish adapted from my mom’s recipe. Soak the shiitake and black fungus 6-8 hours (or overnight) in a container filled with water, and tuck away in the refrigerator. After hydrating, squeeze out the water. Set the liquid aside to make soup, or toss. Slice the mushrooms into ¼-inch thickness or thinner. Set aside. Slice the scallions into 1½-inch lengths. Bisect any sections that are thick, especially the whites. Cut the kamaboko in thin slices, following their half-moon shape, then cut them in half to make quarters. Cut the carrots into matchsticks. Set all of these aside. Cut the beef into small pieces and place them in the refrigerator. Set aside a large mixing bowl. Begin to sauté the mushrooms in a small fry pan on medium heat, with a light coating of neutral oil. Add a pinch of salt and continue to stir to warm the mushrooms through, about 3 minutes. Put the mushrooms in the bowl. Add the scallions into the bowl. In the same pan, take a little more neutral oil and sauté the sliced kamaboko for 2 minutes, just until the fish cake is heated. Place into the bowl. Cook the carrots the same way with a pinch of salt, until the carrots are slightly tender and still have their crunch, about 3 minutes. Pour them into the bowl. Take the cut beef and stir fry them with a small pinch of salt. Cook all the way through and cook out the liquid. Drain on a plate lined with a paper towel, then place into the bowl. Blanch a small bunch of spinach, about 1 minute, shock them in cold water, and drain. Squeeze out the remaining water (the weight will halve to about 85g), loosen the leaves, and put it into the bowl. Add the garlic and sesame seeds into the bowl, and toss all of the ingredients together. Bring a large pot of water to a boil. While waiting, whisk the eggs and cook them on low flame, on a non-stick pan (or carbon steel, or any pan of your choosing that won't let those delicate crepes stick) in two thin sheets. Try not to get too much color on them. Place both sheets on a cutting board and let them cool down for a few minutes. Run a knife through the eggs, slicing them into thin strips. Set them aside. Meanwhile, boil the noodles for 8-10 minutes, stirring occasionally, then drain. Run the noodles in some cool water to stop the cooking and drain again. In a large pan, stir-fry the noodles in small batches with a light coating of neutral oil, about 1 minute for each batch. Pour out the noodles into the large mixer bowl each time. After cooking the noodles, put in the sesame oil, soy sauce, vinegar, and sugar, and toss the noodles with the vegetables and protein. Add the cut eggs in last, and give the noodles a final quick toss. 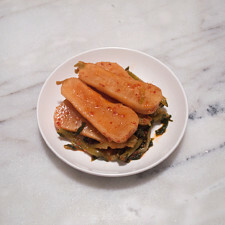 Serve the japchae warm or at room temperature with some soup or kimchi. Don't be too alarmed by the amount I've listed above. You can easily halve this recipe; portions also depend on how much you might be dishing for dinner. If I feel like eating this as a single-bowl meal, I would say the 8 servings would be more likely. If I'm eating this as a meal with an addition (e.g. a bowl of rice), this dish would be more like 10 servings. I understand that the measurements for some of the ingredients are a bit ambiguous. I list them like so because portions of the filling (mainly, the mushrooms) are up to the cook. I love mushrooms in my japchae, so I've added a good amount of them without overwhelming the other ingredients. This dish is great in that you can use a few extra mushrooms or a slightly larger carrot, and it will only *add* to the flavor and color. Equally, I do warn you that those tiny dried wood ear mushrooms look small, but when hydrated, they really grow! One-inch pieces (or slightly smaller) will do just fine. Hydrate the mushrooms overnight as stated, or boil some water and quick-hydrate them in just a couple hours. I cook all of the components separately, then assemble; this is to make sure that one ingredient isn't overly cooked or overly seasoned than the other. I also cook the ingredients in this order so that the colors don't bleed into the next ingredient (e.g. the kamaboko turning orange from the carrot juice, or brown from the beef). 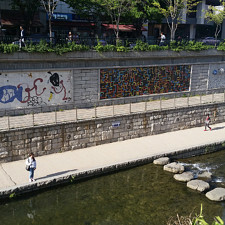 Kamaboko is a form of fishcake that you can find in a Japanese or Korean grocery store. It usually comes on a plank of wood, in half-moon shape, with pink on the outside, white on the inside. 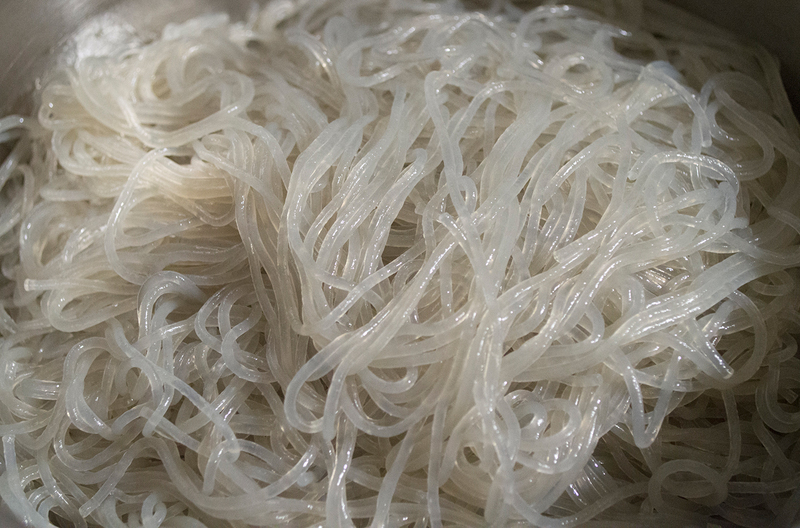 The glass noodles I use are made from sweet potato starch and can be found in most Asian markets. I cook the mushrooms, carrot, and beef with a pinch of salt. I don't season them too much because all of the ingredients are mixed together with the noodles and seasoned again. If the noodles or the vegetables/meat seem too bland, put additional pinches of salt to the mix. I find it easier to control the seasoning when all of the ingredients are in one bowl together. The eggs are cooked without too much browning because we want the dish to have its vibrant yellow stand out. I also add the egg strips last because they break apart into small bits when over-tossed. You can make a quick clear soup by bringing a small pot of mushroom water to a boil. Add some more water to make larger servings (or use broth), and season with some soy sauce to bring up the salinity. Add 1t (for a 2-person soup) of minced garlic and a sliced scallion. Whisk an egg and pour into the soup. Cook for another minute, then serve. I estimate about a cup (240ml) of liquid per serving, so adjust accordingly. It's a good way to utilize the mushroom liquid and have something to complement the japchae. Add some chicken, beef, or mushrooms to make this a heartier soup. This is more à la Egg Drop Soup, a common dish seen in Chinese restaurants. 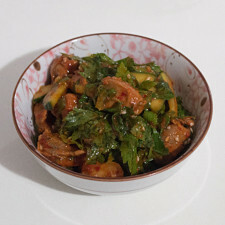 Made our Recipe for Japchae (잡채) - Glass Noodles with Beef and Vegetables? The vegetables and protein, ready to be mixed together. Japchae is an excellent addition to a meal, providing a balance of vegetables and protein, and bringing a bright palette of colors onto the dining table. 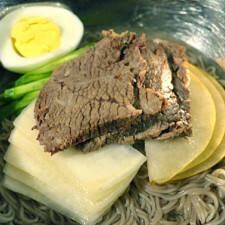 No thoughts on "Japchae (잡채) – Glass Noodles with Beef and Vegetables Recipe."